The Sweratel RTWIP-CORE platform enables network owners, operators and ISPs to deploy flexible, high performance and highly scalable IP(core) mesh wireless/mobile broadband networks. 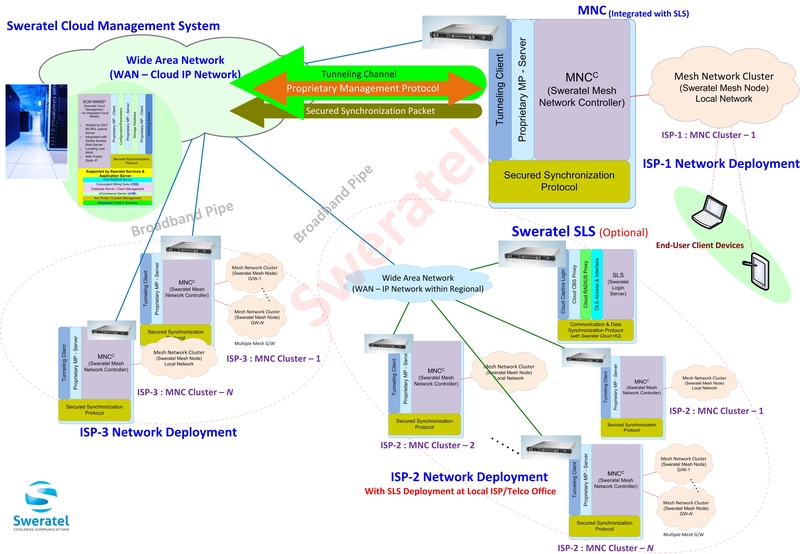 The Sweratel mesh radio network consists of a number of node stations, controlled by a Managed Network Controller (MNC). A typical node system utilizes QuadRadio node-station in multi-sector antennas configuration, communicating with users on the 802.11 standard MIMO air interface. The network is managed by a RNMS Suite, a web-based graphical user interface that provides real-time visibility, configuration management, performance monitoring and control of all elements of the network.